I remembered to bring my camera home tonight – hooray for me. That’s the only thing that went right today. (Don’t ask.) 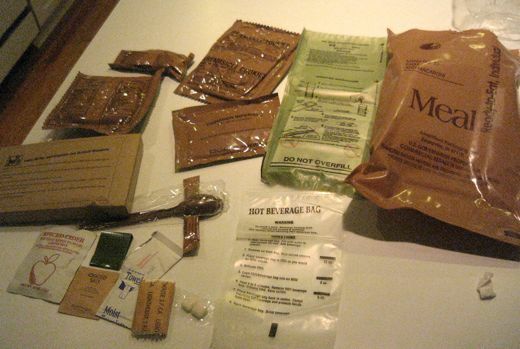 Anyway, I can show you all the surprise package that arrived yesterday – the MRE meal from Peggy. Score! Chili and macaroni, wheat snack bread, cheese spread with jalapenos, and various sweet things – yum! We opened it up, but are pacing ourselves. We’re going to actually cook it tomorrow. Lloyd was super-excited to see that Cinnamon Imperials are in there (Red Hots to you and me), and I’m extremely interested in the creamsicle cookies. I have to say – it is a wonder of gadgety-ness. I especially like how the people who wrote the directions seem to have a sense of humor. “or something” Ha! To any spouses of soldiers who may be out there – please tell your family ‘thanks’ for me! Thanks again, Peggy! Tune in tomorrow for the tasting results…. Lauren Sommerer is a preschool teacher who likes to build prototypes, grow cats, cook things once, save money, reduce, reuse and recycle. Meh. Not as good as I’d hoped. Better Butter… wait, I already used that title. Follow the instructions carefully. We didn’t do it quite right, so the food didn’t get warm. I think our mistake was not using a rock or something. And watch out for the heating element. It gets rocket hot. I’m stealing the Cinnamon Imperials. Don’t tell Lauren. Hey! The Red Hots are gone! These things are like giant grab bags! Each one has all different stuff in it. The one I opened had a really tasty piece of cake in it, and it wasn’t even smashed. Hey, I bet they’d make a great stocking in and of itself… I think I’ll just nail a bunch of these to my fireplace this Christmas and call it a day. “That’s Emaree…” I didnt’ get it at first. Was it the poundcake? That stuff is way too good to be in a MRE. I’m going to look around here for another one for you, Lauren, and for anyone else who wants one. It’s fun to sort through those things! How’s your son doing, Peggy? Does he like MREs yet? He’s at West Point, so he only eats those when they’re out on training. He likes them well enough…he never heats them though…he says they never have time. Overall, he’s doing well! Most Marines I know don’t heat them either. That just doesn’t sound good to me. They’re also really big into mixing as much together as possible. I’ve heard of some really strange concoctions…anything to eat more, faster, I guess. I have a comment stuck in moderation. As a military spouse and Katrina survivor, I find it amusing that you would be EXCITED to eat an MRE. Well, bon appetit! PS these things have about a million calories, so they are not for those who are dieting.